Oasis of the Seas is one ship where you will want to allocate some money for specialty dining, as the quality of the complimentary restaurants, particularly in the main dining rooms and buffet, is not particularly good. We received mealy shrimp, chicken Marsala without sauce and perhaps the strangest-looking preparation of escargot we've had. Foodies will want to look elsewhere on the ship to eat. In terms of crowds, the buffet and main dining rooms can get overwhelmed at peak times, particularly on formal nights and for My Time Dining (where you can enter the dining room any time you'd like between set hours). Interactive Wayfinder signage around the ship tells you which venues have the most room. Oasis of the Seas has three main dining rooms, all of which serve the same menu each night, despite different decor. American Icon Grill is the spot for breakfast, as well as a Brasserie 30 lunch on sea days. None of the main dining rooms are open for lunch on port days. At dinner, American Icon is reserved for the flexible My Time Dining; call for reservations or go see the maitre d' in person. If you show up without a reservation, the lines can be quite long. Grande and Silk offer two seatings for passengers who choose the traditional, set-seating option. Dinners are served as three courses. Menu items range from French to American to Italian. Meat-lovers can also indulge in premium cuts from the Chops steakhouse for $16.95; add a lobster tail for $34.95. Desserts range from sweets and fruit to ice cream and sorbets. All restaurants are fairly noisy, with friendly wait staff who frequently parade and sing. Royal Caribbean's dedicated restaurant for suite passengers is spectacular, with several-story windows providing incredible views. Breakfast is similar to the main dining rooms, while lunch items are a bit lighter. Two Mediterranean-inspired menus are available for dinner, which is by reservation only between 6 p.m. and 9:30 p.m. The ship's buffet is perhaps the one place onboard where you really feel that you're sailing with 6,000 people. At breakfast and lunch on sea days, the area is hectic, with lines at popular stations and very few places to sit. It's much more manageable when the ship is in port. Breakfast has typical options, as well as selections for international travelers and an entire gluten-free station. Lunch has cold selections; burgers, fries and hot entrees; and a selection of cakes and desserts. Windjammer becomes calmer at dinner, with a range of American and some international entrees. Park Cafe wins accolades for its signature roast beef sandwiches and salads. It's a nice alternative to Windjammer in the mornings. This casual spot offers kid-friendly fare for lunch and afternoon snacks; there's also a soft serve ice cream station. At breakfast, this area usually has as an extra omelet station to take pressure off Windjammer. Sorrento's serves several types of slices daily and gives you the option to create your own. Unfortunately, the result is chewy and uninspiring. The Boardwalk Dog House serves -- what else? -- sausages of various types (chicken, all beef, bratwurst) with toppings and potato salad. Cafe Promenade has specialty coffee drinks for a fee, as well as the regular stuff for free. Free pastries, sandwiches and sweets are available at breakfast and throughout the day; the ham and cheese croissants are good for a nosh. On the lower floor of the two-story space set aside for those older than 16, the Solarium Bistro provides complimentary healthy cuisine for breakfast and lunch. A dessert buffet features low-fat and no-sugar offerings. Essentially a juice counter located inside the spa, this cafe attracts health-conscious passengers with free low-fat pastries and yogurt parfaits, as well as green and fruit smoothies (which cost extra). Pricing was accurate at time of review, but may have changed since. Royal Caribbean's at-sea Starbucks outlet; note that Starbucks-branded drinks are not included in any drink packages. Ben & Jerry's provides a premium ice cream selection. This suburban staple serves up burgers, fries and shakes in the heart of the Boardwalk. Lunch and dinner at Johnny Rockets costs extra, but it's free in the morning for breakfast sandwiches and other morning standards. The highlight of this Mexican restaurant is the guacamole, made to order tableside to your desired level of spiciness; the result is fresh and delicious. Entrees include quesadillas, burritos, tacos and ceviches. Look for Happy Hour food and drink specials. In terms of its decor and menu, this Central Park wine bar is a pleasant place for oenophiles. Despite this, the space seemed underused, and the wine tastings were pricy at $40, even for serious sippers. At lunch and dinnertime, tapas are available, or sometimes the bar puts out an all-you-can-eat buffet for a flat fee. Royal Caribbean's signature steakhouse is the most popular specialty restaurant on Oasis and one of the few places you can get lobster. Reservations are highly recommended. The set price at Chops includes two appetizers, one entree (although you can order another for an extra charge), sides for sharing and multiple desserts if you're still hungry. Extra-fee choices include 16-ounce dry-aged strip steaks and 20-ounce porterhouse. The server also brought out a monster Tomahawk chop that could have fed the entire table. You've got three choices at Izumi: hibachi, complete with knife-juggling chefs and your food cooked on the grill in front of you; pan-Asian, with a variety of dishes to choose from; or the sushi bar, where the fish is good quality, and you can order rolls, sashimi, seaweed salad and other favorites like gyoza dumplings. This Italian trattoria, offers quality food and no upselling. The set price at Giovanni's includes family-style appetizers and entrees. Pasta dishes come as a side or entree. A dessert cart comes around at the end; if you're too full, take the tiramisu to go for a late-night snack. The most upscale specialty restaurant on Oasis of the Seas has a six-course dinner menu developed by Michael Schwartz, with wine pairings available for an extra $75. 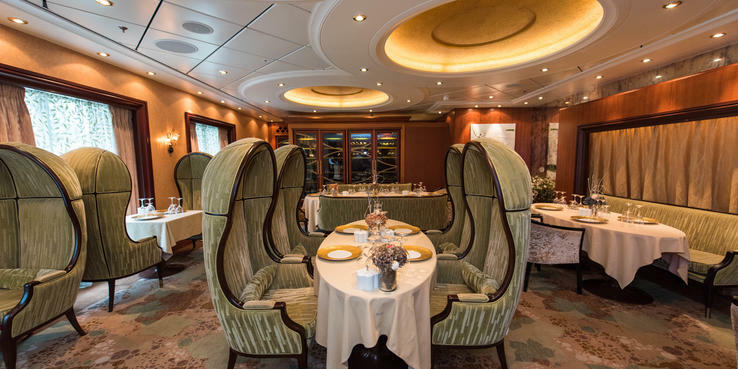 On a seven-night cruise, the 150 Central Park menu changes twice. The restaurant will substitute a course if you don't like an ingredient or have dietary restrictions. At night, this venue converts to a fee restaurant that serves elaborate healthy fare. A dessert buffet features low-fat and no-sugar offerings. This special six-course dinner, complete with wine pairings and limited to just 14 diners, is held twice per cruise. Participants meet in the Champagne Bar for a drink first and then head to a special table set up in the Suite Lounge. You'll receive a copy of your menu to take home. We recommend Chef's Table over 150 Central Park for wine-lovers, as we found the pairings there to be a better value. Keep in mind that Chef's Table forces you to be social, while 150 Central Park has tables for couples and groups. The Chef's Table can also last a long time, up to three or four hours. Reservations are essential.